Located at the heart of Brighton, the modern Thistle Brighton hotel is situated close to the Royal Pavilion. It is just a stone’s throw from links to the public transport. This 4-storey hotel comprises a total of 204 rooms, of which 4 are suites, and facilities include a reception desk, shops, a coffee shop and a hairdressing salon. 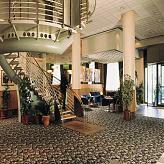 Guests may also relax in the cosy bar, dine in the restaurant and make use of the 6 conference rooms. Each of the comfortable rooms comes with an en suite bathroom with hairdryer, a direct dial telephone, a minibar/fridge, centrally controlled air conditioning and a hire safe. An iron and ironing board as well as a trouser press are available on request. In the outdoor complex there is a sun terrace to take advantage of and there is also an indoor swimming pool as well as a sauna. 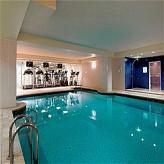 Sports enthusiasts may pay a visit to the in-house gym. From Gatwick airport, take the M23 straight to Brighton. Continue through Brighton city to Brighton pier and take the right-hand turn at the roundabout. The hotel is situated 100 metres along on the right-hand side.